*As you can see, there are still server problems with Photobucket. I apologize for all of the missing elements, it looks terrible, but there isn't much I can do. 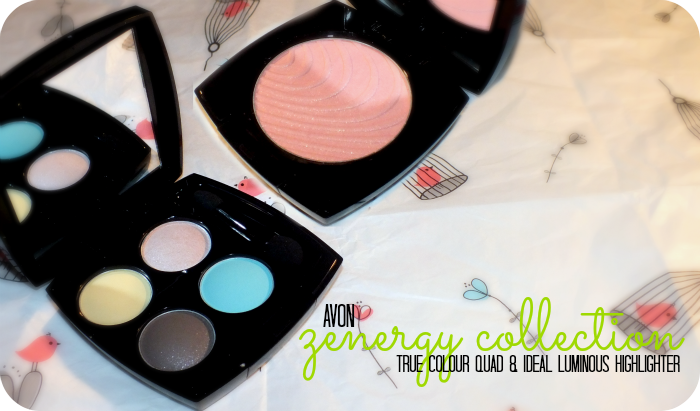 We've seen the lips (here) and the tips (here) and now we'll take a peek at the eyes and cheeks portion of Avon's Zenergy Collection. 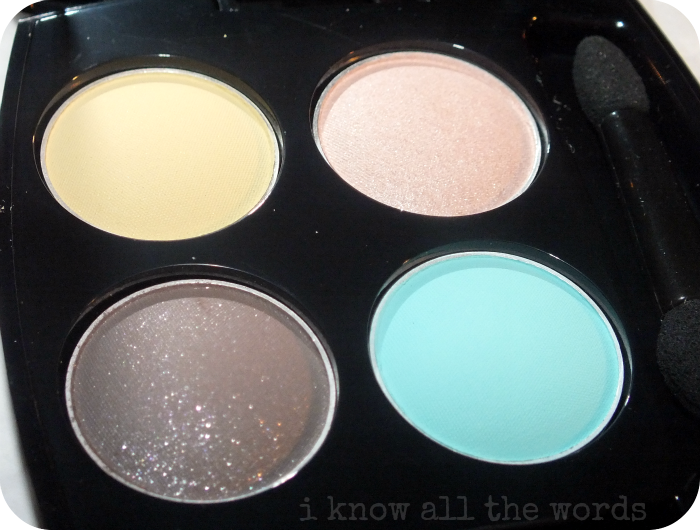 The lipsticks and polishes are nice, but the the quad and the highlighter the most enticing part of the collection. When I first popped open this quad my first thought was 'Err... No.' 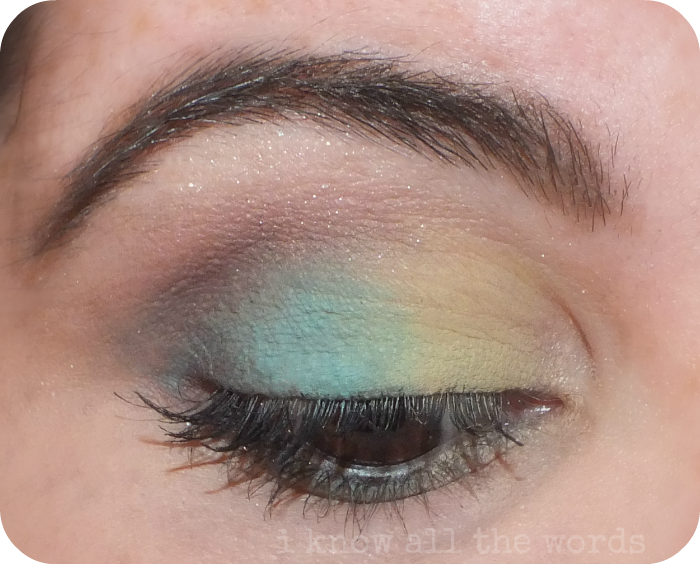 While I like the colours- chartreuse may just be my all time favourite colour, I just couldn't see these colours working as eyeshadows for me. In theory I know blue shades have the potential to really bring out my brown eyes, but thanks to their notoriously ugly stint in the 70's and 80's I get frightened whenever I come across one. All that aside though, what's a blogger to do but try them. More on that in a few. 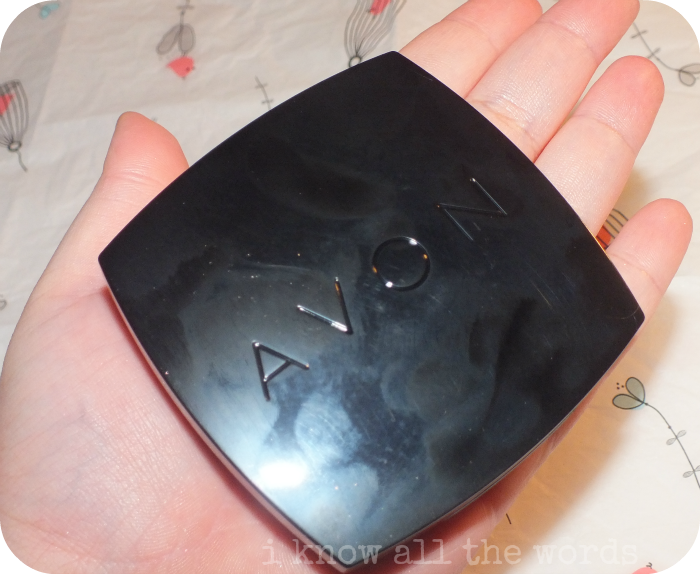 Avon's quads are housed in sleek yet durable black compacts that look pretty similar to Chanel's. They include a full mirror and a sponge tip applicator. The quad has two matte shades- the chartreuse and the bright baby blue, and two shimmers- the pale fleshy pink, and the chocolately taupe. 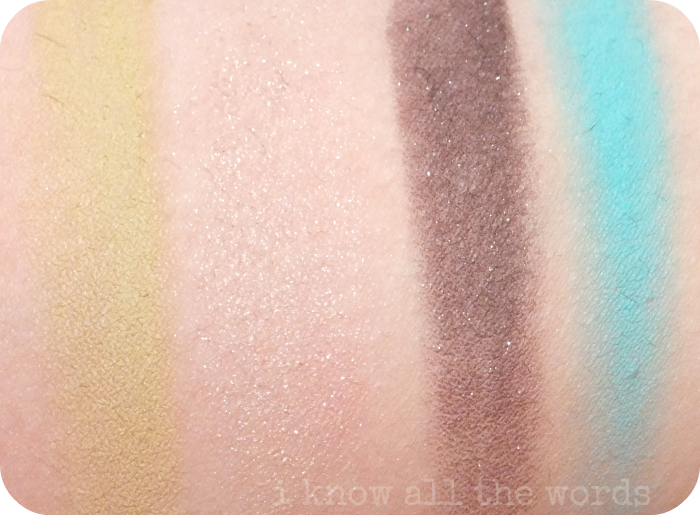 All of the shades are quite decently pigmented, but I find that the mattes are a bit powdery and require a bit of finesse to apply. I found if I dampened my brush a bit it made them super easy to apply and cut the powdery-ness down to almost nothing. The pale, fleshy pink shade is pretty much the same shade as my skin and also contains some chunky glitter. I didn't think I'd like it, but it did make a nicely glowy highlight once blended on. The chocolate tinged taupe is a great shadow all around with silver shimmer and makes a great crease shade. While applying these shadows, I still was convinced that I'd end up liking the finished result, but I soldiered on (I've got soul, but I'm not a soldier...) and you know what? I kind of love what the blue shade does to my eyes. 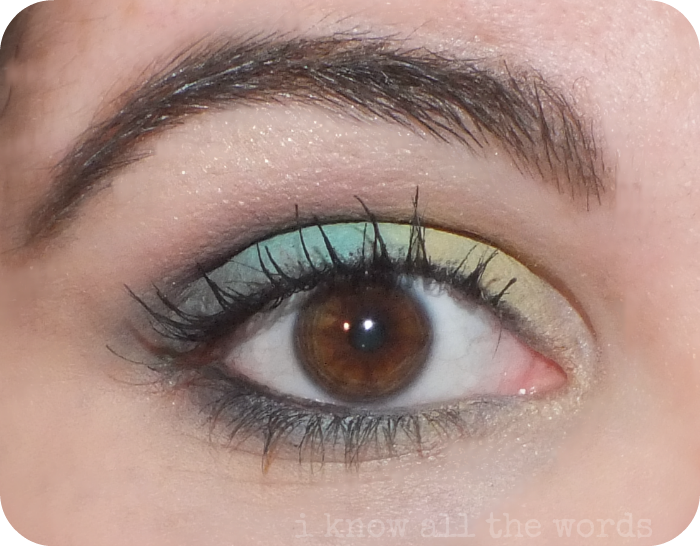 Something about the pop of the bright baby blue shade just makes my eyes look amazing and huge. Never a bad thing! You know I love me a highligter, so needless to say I was excited to see what Avon was offering up. I don't think that I can recall Avon ever having released a highlighter before... Anyway, Revitalized is pretty stunning in the pan with it's wavy pattern. It too is housed in the same sleek, black compact as the eyeshadow quad, with a full mirror. 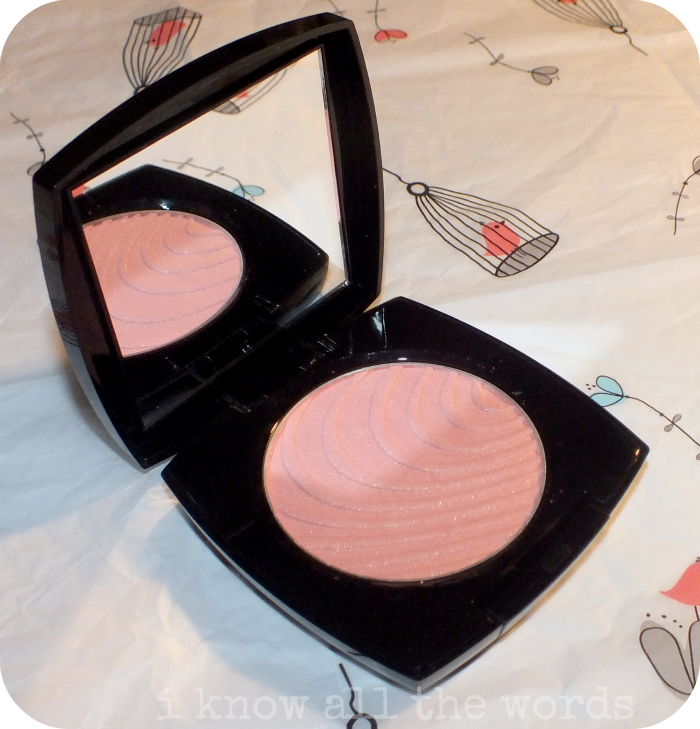 The highlighter itself is more pigmented than I expected and applies more like a highlighting blush. 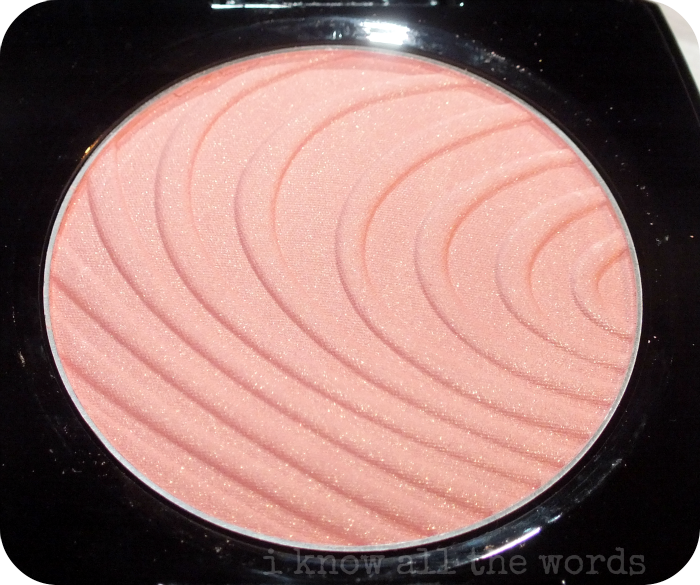 The shade is a peach kissed pink with fine golden shimmer. 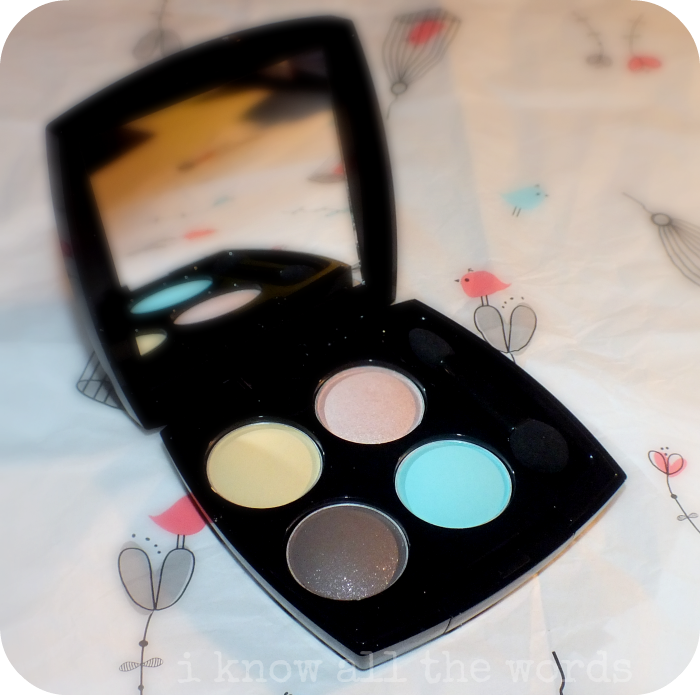 The product is nicely pigmented; the perfect balance of not too pigmented and pigmented enough. The powder is smooth, but it does kick up a bit when you swirl your brush over it. On cheeks, it gives a pretty natural flush with a luminous glow. 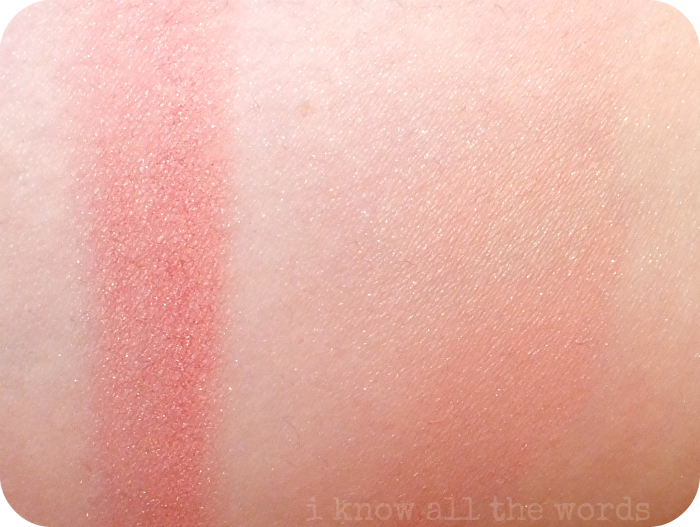 Great for days you don't want to have to use both a blush and a highlighter. Overall, two great products! Do you change what shades you use season to season? Which shades do you opt for come Spring? This song popped into my head when I typed 'soldiered'. I haven't listened to The Killers in sooo long! I lost a bit of respect for Brandon Flowers when I saw them live a few years ago. He was wearing this huge wool band leader-esque coat throughout the whole show. In the middle of July. He looked like he was going to pass out the entire time. Fashion is one thing, but that's just stupid.